Home › Blog › Is your pet a climate problem? Is your pet a climate problem? The dog is said to be man’s best friend, but is it a climate enemy? Dogs and cats are as fond of meat as are their owners. And therefore their CO2 emissions make up a substantial part of their owners emission totals. 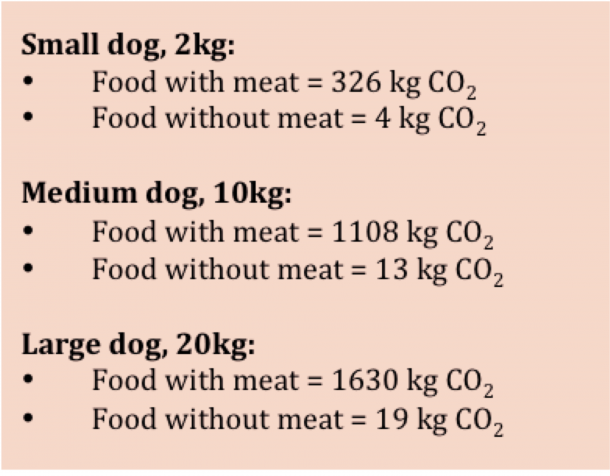 In fact, our calculation shows that a 10 kilo dog like the ones below on average emits up to 1.1 tonnes of CO2 annually, mainly through their meat consumption. Last week I was called in as an expert for a radio programme: P1 – ‘Your dog, the climate enemy’. This segment is part of a series, ‘The climate testament’, that addresses climate issues and what each of us can do to alleviate some of the problems we face today. The largest and most obvious problem with cats and dog lies with their meat consumption. As meat is produced, we see both land use effects and various greenhouse gas emissions, since the conversion from plant to animal protein is very inefficient, esp. for the bigger animals like pigs and cows. For the radio programme, I had calculated emissions for three different dog sizes and I compared these to driving a car, where the emissions from small dog is equivalent to driving up to 1000 km in a average Danish car, while the big dog equals up to 5200 km driven, provided the dogs eat meat. I based these rough and average calculations on the current dietary recommendations for each of the weight classes given by professor Charlotte Bjørnvad. Bjørnvad is a professor in Internal Medicine at Department of Veterinary Clinical and Animal Sciences, University of Copenhagen. Luckily for the environmentally conscious pet owner, Bjørnvad explained that a conversion to a more climate neutral diet is possible. Dogs have had a long co-evolution with humans, eating the leftovers from our table. So in spite of their wolf ancestry, they can now thrive on a vegetarian diet. This is also a consequence of breeding, with all the genetic changes that this entails. Charlotte Bjørnvad explained how we could give them a protein base from e.g. beans combined with eggs, but let their main energy come from carbohydrates. In fact, a dog’s digestive system can handle carbohydrates and fibres from vegetables, provided they are heat-treated, just as is the case for humans. So there is now enough knowledge to suggest it is safe to switch to a vegetarian diet for our canine friends. For cats, it remains a bit more tricky – a suggestion in the programme was to include insects as a source of animal protein for the cats, since they need a wider range of animal proteins in their diet, compared to both humans and dogs. So starting from a rather polemic initial question; we arrived safely at the end of the radio programme at a solution that can be directly implemented in your dogs food bowl – next step is to push the pet food market in the right direction. For those of you that understand Danish the podcast and Danish article is here.